Centrifugal sand separator. The shaded arrows show the sand; the white arrow shows the water. Source: Courtesy Claude Laval Corporation. 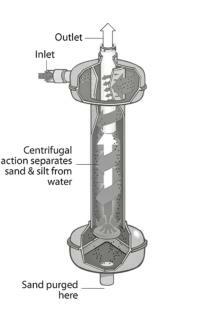 A centrifugal sand separator, often used for pre-filtration, removes larger particles of sand. Water entering the separator is forced into a spiral flow pattern, developing centrifugal forces that cause the sand particles to move to the outer edge of the separator. These particles then settle out of the water into a collection chamber at the bottom. Clean water flows out of the separator at the vortex of the rotation, along the separator’s axis. A sand separator is effective in removing as much as 98 percent of particles that are too large to fit through an equivalent 200-mesh filter. The device does not remove organic material. A sand separator should be used as the initial filter on any irrigation system that is pumping appreciable quantities of sand, and should be followed by another type of secondary filter to take out the finer particles. For proper operation, a sand separator must be sized to match the flow rate, using information provided by the manufacturers on the relationship between flow rate and pressure drop (fig. 10). A properly selected separator will have a pressure drop of 5 to 11 psi when operating. If the flow rate is too small for a given sand separator, it will not be effective in removing sand; a flow rate that is too large will cause excessive pressure losses. Variations in the flow rate can cause a sand separator to operate ineffectively. If you use the same pump to irrigate fields of different sizes, the flow rate may vary from field to field as the pump flow rate changes with field size. 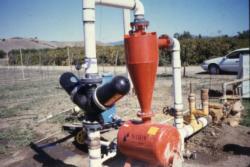 A centrifugal sand separator is normally installed on the discharge side of the pump. It can also be installed in a well on the intake side of a deep-well turbine. 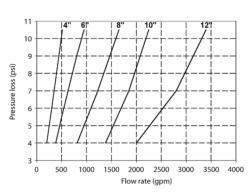 Pressure loss in relation to flow rate in a centrifugal sand separator. Each line represents a different size of centrifugal sand separator. Source: Courtesy Clemons Sales Corporation.